This looks beautiful in my kitchen and works really good too, couldn't be happier. Cleaning is made easy with this VIGO Kitchen Soap Dispenser. For added luxury, this model features a fully plated reservoir in a finish that matches the pump. Designed for mounting with pump above the counter and reservoir below. Reservoir can easily be refilled from the top for added convenience. Works great with hand soap, dish soap or hand lotion for your household needs. The stainless steel soap dispenser is a high quality product, it was easy to install and very easy to refill with soap or lotion. When the granite countertops were being cut to accommodate the soap dispenser and the faucet, the installer commented about the high quality of the product and that I must have been expensive sine many of the are made of plastic. Of course I didn't tell him it was purchased from Overstocked and it was an affordable price. The soap dispenser looks great on the sink and I don't need to have a plastic soap dispenser from a he store, less items on the sink. I would definitely recommend this stainless steel soap dispenser. I wish that I had purchased two one for hand soap and dish detergent. It looks very expensive and classy. Just remodeled our kitchen and it is now very modern. This dispenser works great, administers just the right amount of soap. Was really easy to install according to our plumber. My only complaint is that there is a part of the dispenser that rests on the counter (like a disc) that is GOLD!?!?!?!? It bugs me every time I look at it. Pumps the soap nicely and efficiently. I was surprised to see that the soap reservoir was also stainless steel colored-- plastic would probably have sufficed since the reservoir lives under the sink and no one sees it, but it was an unexpected luxury touch. Although expensive for a soap dispenser. I wanted everything to match with my new fancy and sink. I had the granite contractor drill me 3 holes. 1 for the restaurant style faucet I got on OverStock.com and 2 for the soap dispensers. One for dish liquid and one for hand soap. The other benefit is that if I decide to later I can switch one out to a hot water heater/dispenser. These items are also great because they fill from the top. Some you have to crawl underneath the sink every time you need to refill. These also have an all stainless steel body. Unlike some of the plastic versions that will age over the years and crack on you, these were built for a lifetime of use. Awesome and sharp looking. Just like with the Vigo faucet I purchased, I was a little leary of purchasing the Vigo brand. To be very honest, I wasn't familiar with the brand. I read the reviews on this and the faucet. All the reviews were good so I gave it a shot. I found the price on Overstock to be the best around. The quality of this dispenser surpasses others. I shopped in local box stores for dispensers. All of them had a plastic bottle. Not this dispenser! The entire dispenser the tank/bottle and the pump are all stainless steel. It was easy to install, but I do warn that you will need a second set of hands to hold the collar as you tighten it to attach it to your sink. Good looking matches my contemporay kitchen decor. Stainless matches perfectly with my stainless steel faucet. Finish is nice and it installs easily. It is easy to clean, just have to make sure to keep hard water stains off regularly, otherwise, it may accumulate in the crevices. The only thing I wish is that it had a bigger soap reservoir, it seems to run out more often than I would like. Should be pretty easy to find something else that has the same threading though to replace it. This is a great addition to my new granite counter. 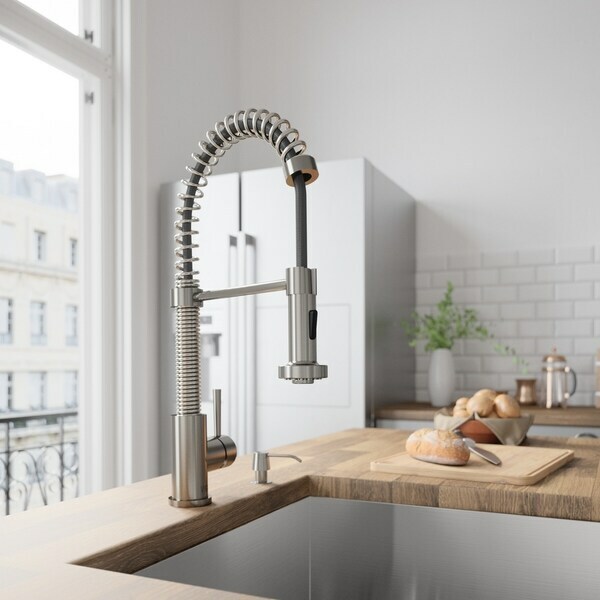 The dispenser shape is sleek and the spout is plenty long to extend nicely into the sink. Most importantly, it dispenses the soap with good force...only one push needed for a good amount. I purchased the Vigo faucet that matches and it is fabulous. Thanks for a great design and amazingly low price. Nice looking, the container to hold the soap is longer than I expected. Check the dimensions to make sure it works with your sink. I have a farm sink that they had to support with additional bracing from underneath the sink cabinet and had the counter top guy not been there to help me I wouldn’t have gotten it in He notched out the brace so the soap holder would fit. The soap thankfully is added from the top does get finger smudges. Very functional, still there; two of them and used daily. yes i would recommend this to a friend. It looks great with the sink and very good looking. loved it! very well made and a perfect fit if you're looking for great quality, craftsmanship and design! This is a basic soap dispenser, but matches the Vigo faucet that we purchased. I do recommend the combination. It hasn't been installed yet...but it looks great....i can't wait to use the new kitchen! Merry Christmas everyone! Looks and works great! Definitely recommend! "Hi, I bought this years ago, and never was able to get the dispenser to work, I believe it's simply defective. Even my professional plumber concluded the same thing when I had him look at it real quick one day. Can you please contact me about sending a replacement? I just need the main head, there's simply no pressure or suction happening for the soap. Please have customer care contact me via email, thank you." "will the gold disc (part of the brass ring) sit on top of the counter as one reviewer said or underneath?" Hello AIBurn, you will be contacted by Customer Care. Previous Vigo order for new faucet. "DOES THE PUMP PULL OUT TO FILL THE SOAP OR DO YOU HAVE TO GO UNDER THE SINK AND REMOVE IT?" Hello smily5200, this dispenser is designed to be refilled from under the sink. Thank you for shopping with us!